Does whisky change in an unopened bottle? Keeping hold of a unique bottle of whisky to mark a special occasion? It may not necessarily taste the same in 20 years as the day you bought it, thanks to a phenomenon known as the ‘old bottle effect’. The Whisky Professor explains why. Time capsule: This 1862 bottle of Old Vatted Glenlivet was only opened in 2017, but had the whisky changed over time? At a recent whisky tasting I heard people talking about ‘OBE’. I initially believed that they were discussing Dennis Malcolm’s career, but it transpired that they were referring to something called ‘old bottle effect’. I was under the impression that whisky didn’t change in an unopened bottle. Am I wrong? 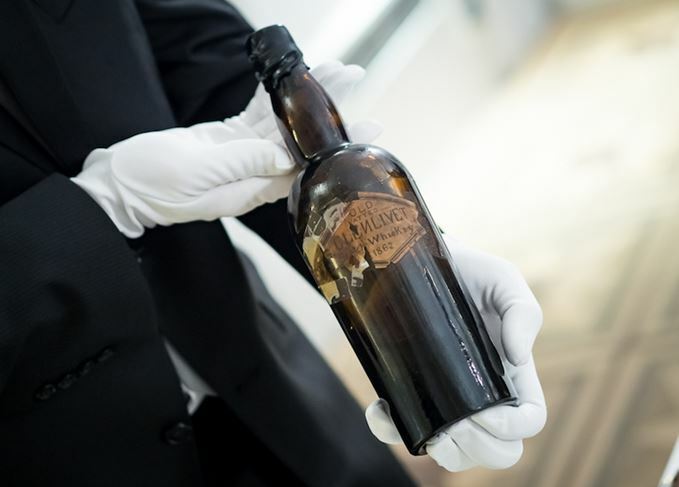 The official line is that whisky does not change in the bottle as long as that bottle remains unopened, but many collectors will argue that the opposite is the case. What the disagreement comes down to is whether oxygen will affect the liquid in the bottle. While it is wrong to say that whisky behaves in the same way as wine, the principles behind the two are the same. If a cork is used to seal a wine bottle, some slow oxidation of the wine will still take place. If that is uncontrolled – the cork is loose for example, then too much air will come into contact with the wine, turning it brown and increasingly nutty. Eventually it may even turn to vinegar. On the other hand the gentle, slow oxidation given by cork can produce desirable effects in many red wines (Bordeaux, Burgundy Barolo, etc) and some whites (Burgundy, Sauternes etc). The reaction takes place in the headspace between the liquid and the cork and is most rapid soon after the wine has been bottled, then slowing as that air is used up and continuing at a relaxed pace as tiny amounts filter through. The effect in wine will see a decrease in fresh fruitiness (ester levels) but an upping of vanilla and coconut (a change in the nature of lactones) and some nuttiness – also seen as toastiness in white wines. The wines also will be less astringent as phenol levels fall and tannins polymerise, changing the mouthfeel. In red wines the colour will start to fade slightly, picking up slight brown hints if the ageing period is extended. Synthetic corks actually increase the amount of air entering the wine. If however a screw cap is used to seal the bottle the opposite reaction takes place. In these cases, the ingress of oxygen is more effectively stopped. This keeps the wine ‘fresh’, which is desirable for lighter (often non oak-aged) white wines or lighter reds where the impact of fresh fruit is wanted. Here, the lack of oxidation sees ester levels increase, upping fruitiness and some floral elements. The lack of air can also work to the detriment of the wine increasing sulphur compounds. While the colour will be fixed, there’s some evidence that the polymerisation of tannin still continues. You could expect that the same takes place in whisky, dependent on what type of closure is used, either oxidation with cork, or the reductive effect given by screw caps. There is an important difference between wine and whisky – the higher levels of ethanol in the latter. This will absorb the oxygen, reducing oxidative effects and slowing the process further. Looking at how OBE is described: tropical fruit, peachiness, smooth mouthfeel, low tannin, waxiness, integrated smoke, would suggest that OBE is more driven by a reductive effect rather than oxidation. There is another issue however: the difficulty of clearly separating what might have happened within the bottle and what changes occurred in distillation during the period the whisky has been in the bottle. Think of the possible variations which could have happened at a distillery over the decades: peat may have been used in the past, barley varieties have changed, while wort clarity may have been altered if a traditional mash tun was replaced with a lautering systems; then there have been changes in yeast strains, and possibly fermentation regimes, direct fire may have been replaced by steam coils and worm tubs by condensers; then there are the cask types used, the quality of the wood and the conditioning of the casks (such as the use of paxarette). Just one of these changes could affect an individual distillery character. This would be multiplied when you start to consider blends. Because we are not dealing with a liquid which has been made in an identical fashion for decades it is impossible to say whether the OBE effect is driven by ageing in the bottle, changes in distillation, or a combination of the two. The only way to test this would be to take a whisky being bottled today, analyse its production methods, run a gas chromatography and sensory analysis and then leave it for 20 years in an unopened bottle to see what changes might have occurred. So, the conclusion? Something happens but it happens slowly. What it is precisely? We are still not sure. Maybe time will tell. P.S. What I have outlined here is however different to the question ‘does a whisky go off in the bottle, or can light and temperature affect flavour over time?’ which are possible topics for a future discussion – if anyone is interested.